AAC&U VALUE Project on assessment, an effort that stresses authentic assessment of student work. Middle States Student Learning Assessment Handbook: A resource created by the Middle States Commission on Higher Education that covers learning goals, methods of assessment, and using assessment data to improve student learning. National Institute for Learning Assessment Outcomes: includes national reports and surveys on assessment in higher education. This is a nice list. Wonder if we could also include the list of disciplinary resources on assessment that I assembled for the old site? Basically it is a list of links to what the various disciplinary associations say about assmt within their field, and learning goals within their field. Good idea. I added it to the list. 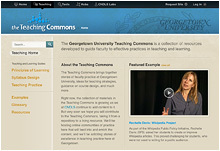 CNDLS' new Teaching Commons is an online collection of teaching and learning resources designed to support faculty in their pedagogical research and implementation.